Where to find Charlevoix hotels near an airport? How can I find hotels in different Charlevoix neighborhoods? Where can I find hotels in Charlevoix that are near tourist attractions? 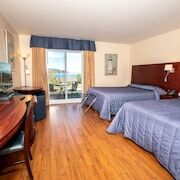 Unfortunately Expedia doesn't list accommodation options in Charlevoix, however our comprehensive database has an extensive range of budget and luxury hotels in the area. 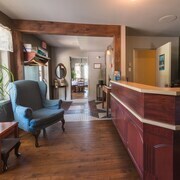 Within easy driving distance of Charlevoix visitors can select from around 23 places to stay. The Auberge La Grande Maison, Quebec, which is the closest accommodation, is located 25 kilometres (14 miles) from downtown Charlevoix. 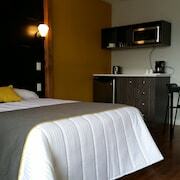 Alternatively, you could try the Hotel Baie-Saint-Paul, located in Quebec, which is 25 kilometres (14 miles) away. Another option is Sacre Coeur. Sacre Coeur is where you'll find the Canopee Lit and Centre de Vacances Ferme. Or, try L'Anse-Saint-Jean, where you'll find the Maison de Vébron and Chalets Sur Le Fjord. Petit-Saguenay is 75 kilometres (48 miles) from Charlevoix's downtown, while Saint-Simeon is 60 kilometres (36 miles) from the heart of Charlevoix. 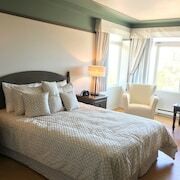 The Auberge du Jardin and Auberge les 2 pignons are situated in Petit-Saguenay, while Motel Cofotel and Gite Aux Tournesols are in Saint-Simeon. Thrifty travelers rejoice! The Charlevoix area offers a good selection of keenly priced places to stay. 25 kilometres (15 miles) from Charlevoix's downtown area you'll find the Gîte TerreCiel. 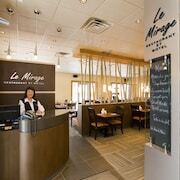 The Hotel Georges de Charlevoix is only 25 kilometres (15 miles) away. 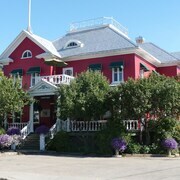 Other Charlevoix hotels in the cheaper range include the Econo Lodge and the Gîte Les Petites Mésanges. 35 kilometres (21 miles) from the main part of Charlevoix, is the Hôtel Motel Les Voitures d'Eau. The Gîte Les Colibris is 25 kilometres (15 miles) away. 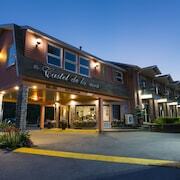 You could also choose to book a bed at the Motel des cascades or the Auberge La Maison Otis. Why not spend some time exploring Theatre la Rubrique and St-Dominique Rectory, which you'll find in Jonquiere, 100 kilometres (61 miles) to the northwest of Charlevoix. 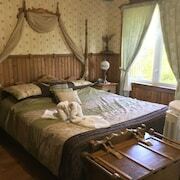 Should you wish to spend a few nights in Jonquiere, check out the room rates at the Auberge Les Deux Tours and Appartements aux 4 roues. Or, you could stay in Beaupre - Mont Sainte-Anne, 70 kilometres (42 miles) to the south of Charlevoix, where you can pick from the Au Domaine des Neiges and Chateau Mont Sainte Anne. While in Beaupre - Mont Sainte-Anne, make sure you visit the Snow Spa and Sanctuaire Sainte Anne de Beaupre. Before you pack your bags for Charlevoix, why not look through our Charlevoix travel guide where you can explore the extensive cultural and scenic attractions this great destination has in store for you. What are the most popular Charlevoix hotels? Are there hotels in other cities near Charlevoix? What other types of accommodations are available in Charlevoix? Explore Charlevoix with Expedia.ca’s Travel Guides to find the best flights, cars, holiday packages and more!